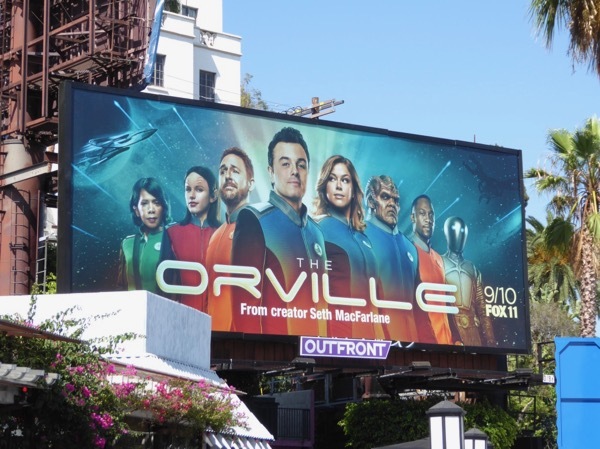 Just when Star Trek thought it was safe to boldly go once more on a television screen near you, along comes a similar concept to spoof the beloved science fiction franchise, more in a style reminiscent of Galaxy Quest. 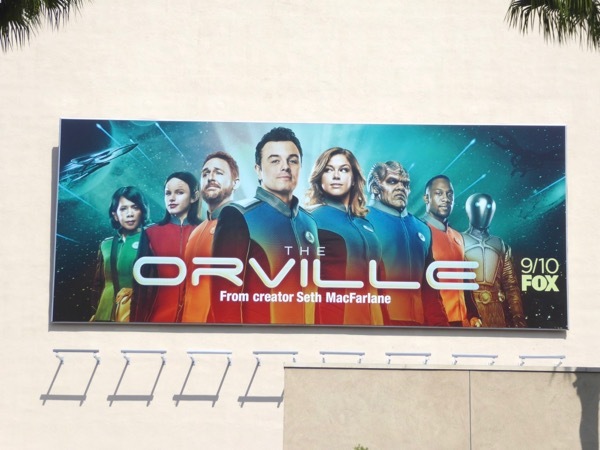 The Orville has its own version of Star Fleet and its own unique spaceship manned by a diverse crew of humans and alien life forms, with Seth MacFarlane's 'Captain Ed Mercer' at its helm. On their comedic mission to the stars Adrianne Palicki, his ex-wife, is assigned as his First Officer, Penny Johnson Gerald the ship's doctor, Halston Sage a superpowered alien, Scott Grimes the man-child helmsman, Peter Macon a member of an all-male race sporting Klingon-like makeup, J. Lee a wise-cracking crewman and Mark Jackson's artificial robot lifeform 'Isaac'. 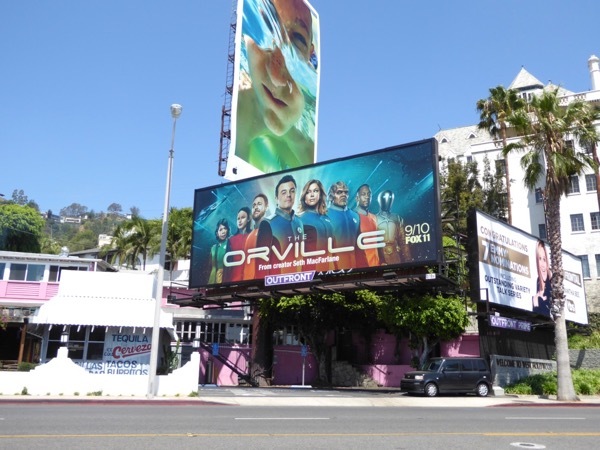 These series launch billboards were first snapped along West Hollywood's Sunset Strip by the Chateau Marmont Hotel on August 4, then later at Fox Studios along Pico Boulevard on August 26, 2017. 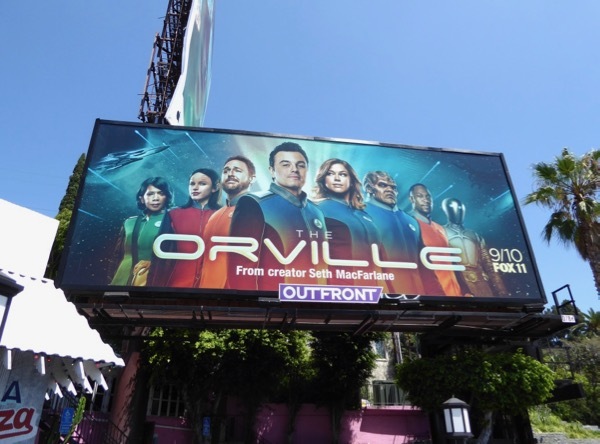 Seth MacFarlane fans can also enjoy these movie billboards for A Million Ways to Die in the West, whilst you can also compare this sci-fi parody to all these Star Trek TV and movie billboards. Can the U.S.S. 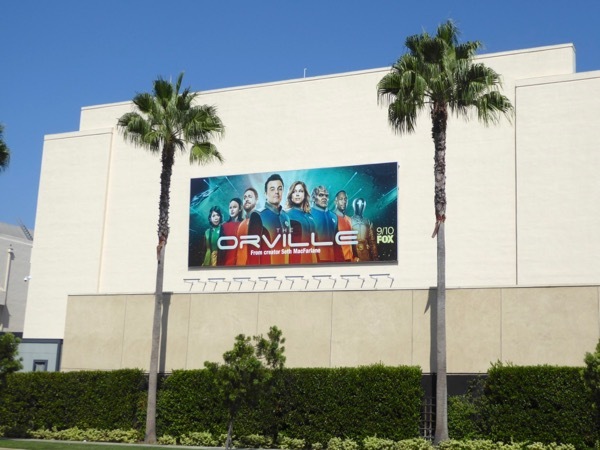 Orville explore the future of comedy and live long and prosper amongst the stars, or will this spoof end up lost in space this new TV season? 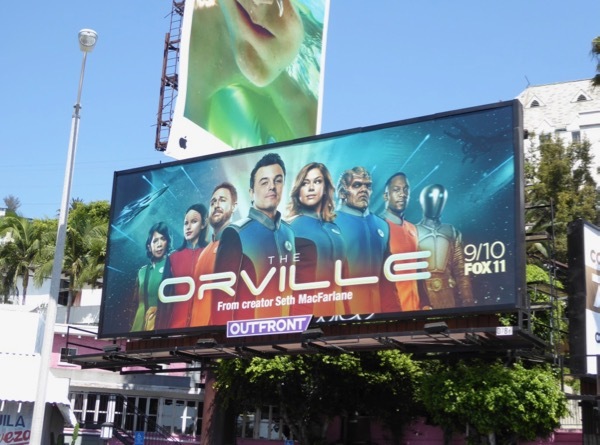 UPDATED: The Orville is back with more outer space comedic adventures with this season two billboard spotted at Fox Studios along Pico Boulevard on December 9, 2018. 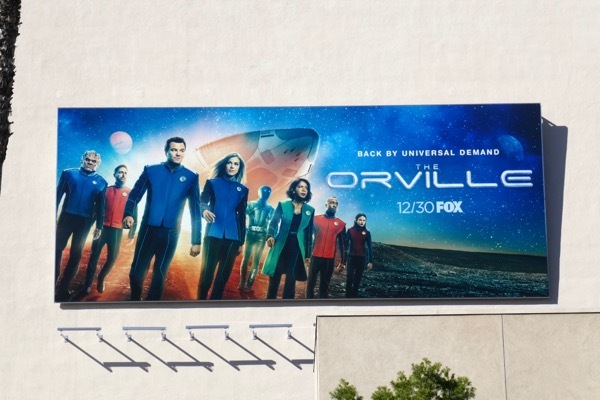 Plus fans of the show can also check out these costumes from The Orville's first season.